Starting September 13, FallintheMountains.com will post a weekly color snapshot of how leaf season is progressing in the Blue Ridge Mountains. Using insider tips, pictures, video and foliage updates from naturalists, attractions and park officials around the region, travelers can plan color-filled adventures for their fall getaway. For a sample of past color reports, check out the last weekly update from November 2009. Color Updates via RSS: Sign up for the Color Hunter Blog & Weekly Color Reports. Fall Family Fun for Four! Located along the Blue Ridge Parkway and just outside Great Smoky Mountains National Park, the Asheville area is steeped in natural history and full of fall adventure. Extreme changes in elevation and hundreds of deciduous tree species, the largest variety in North America, combine for one of the longest and most vibrant leaf seasons in the country. The autumn colors create a mountain patchwork that varies from deep maroon, burnt orange and crimson, to almost neon shades of yellow, tangerine and raspberry. TIMING: Beginning as early as mid- to late September, the color moves down the mountains and into the middle and lower elevations. The elevation jumps thousands of feet just minutes outside of Asheville. 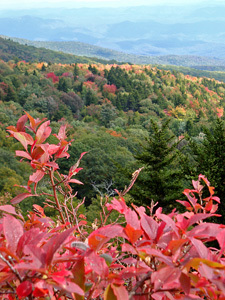 For example, the Blue Ridge Parkway carries early-season leaf peepers to color on the highest peaks east of the Mississippi River at Mount Mitchell State Park. Late-fall travelers can take a scenic drive to 75-mile views of Hickory Nut Gorge from Chimney Rock Park. Downtown Asheville generally peaks somewhere in the middle. WEATHER: The best recipe for fall color is, generally, warm sunny days and cool nights. Color development always depends on the weather and varies greatly from mountain to mountain, so weekly color reports are key to planning fall adventures (FallintheMountains.com). Savor the unmistakable sound of Appalachia as the Grammy Award–winning singer performs classics like "18 Wheels and A Dozen Roses" and "Where&apos;ve You Been" surrounded by the autumn beauty of Biltmore. Friday, Oct. 1 at Diana at Biltmore, the new concert venue with sweeping views of the Blue Ridge Mountains and America’s Largest Home. Tiny trees, big fall color! Did you know bonsai trees change color in fall just like their larger counterparts in nature? This two-day horticultural extravaganza, situated in the midst of the colorful mountains, features a display of bonsai from enthusiasts in a six-state region, live demonstrations, workshops and a popular bonsai marketplace. It’s also the perfect occasion to explore the Arboretum’s permanent Bonsai Exhibition Garden, which offers a world-class display that innovatively establishes bonsai using species indigenous to the Southern Appalachian mountains. Oct. 9-10. Experience cultural enrichment from all over the world Oct. 14 through 17 at the Lake Eden Arts Festival. Occurring twice a year since 1995 and located just minutes outside Asheville in historic Black Mountain, LEAF has established a reputation as being one of the best festivals in the southeast. In 2001, it was recognized by The Washington Post as “The best cultural mix and match festival in the nation.” The festival includes international and local music, handcrafts, dancing, cuisine, children&apos;s activities, outdoor adventures, drum circles, a zipline, canoeing and more. Recently named “Beer City USA,” Asheville celebrates its unique craft brewing culture and borrows the best of Bavarian traditions for Oktoberfest 2010. Oktoberfest features authentic German food from local, independent restaurants, a beer garden of local taps, and lederhosen and dirndls. Live music by the Stratton Mountain Boys and The Goodies bookend crowd-pleasing contests including a keg roll, pretzel toss, group chicken dance and stein races. Presented by Asheville Downtown Association. Saturday, Oct. 10 from 1 p.m. to 5 p.m. on quaint cobble-stoned Wall Street. The 22nd Annual Apple Harvest Festival set for October 16 in Downtown Waynesville from 10 a.m. to 5 p.m. The annual festival, which celebrates the harvest season, features handmade arts and crafts, locally-grown apples, apple products, authentic mountain music, dancing and a children&apos;s fun area. For four days in July and October, the Asheville Civic Center comes alive with fine traditional and contemporary crafts. The Craft Fair, a local tradition since 1948, showcases the work of 200 Southern Highland Craft Guild members and features craft demonstrations and live regional music. Oct. 21-24. The AICFF is a family film festival with value affirming culturally diverse cinema. By using media as a tool to stimulate critical thinking, our goal is to promote intelligent dialogue through the introduction of inspiring stories, exhilarating adventures and pure cinematic joy. Festival events will include: An opening night gala, pancake breakfast, workshops, film experiences, Family Support Network of WNC film screenings. Nov. 1-14. The biannual Studio Stroll is your chance to tour the colorful warehouse art studios in the River Arts District along the French Broad River. Meet and buy directly from glassblowers, painters, potters, jewelry makers, sculptors, fashion designers and fiber artists. Within just a few blocks you will find an eclectic array of creative artists…from traditional folk artists to metalworkers known for edgy kinetic sculptures. Just minutes from downtown Asheville. Free. Nov 13-14.